One of the greatest human accomplishments has been the spectacular improvement in health since 1950. In developing countries, life expectancy has risen from 40 to 65 years, and the chances that a child will survive to the age of five has doubled. In addition to directly improving people's lives, this progress contributes to economic growth. While some of the improvements in health is the result of overall social and economic gains, about half of it is due to specific efforts to address major causes of disease and disability—such as providing better and more accessible health services, introducing new medicines and other health technologies, and fostering healthier behaviors. Millions Saved: Proven Success in Global Health is about part of that success story: 17 cases in which large-scale efforts to improve health in developing countries have succeeded - saving millions of lives and preserving the livelihoods and social fabric of entire communities. 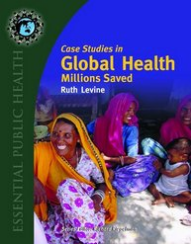 Case Studies in Global Health: Millions Saved published by Jones and Bartlett in 2007 contains 3 new case studies and updates to the 17 original success stories. The case book accompanies an undergraduate global health textbook by Richard Skolnik.